It’s still August and it’s hotter than hell, but we are surrounded by pumpkin beers on our shelves. The question is, which one do we choose. I just received an email from Hy-Vee outlining the many pumpkin beers they are carrying. I didn’t see O’Fallon on their yet, hopefully we get that one in the next few months. So, which is your go to? (I liked Schlafly and Sam Adams, didn’t care for New Belgiums at all). We first made this cider three years ago in 2010. It has become extremely popular since then. We add cinnamon, cloves and allspice to fermented apple juice to produce a 5 per cent cider which tastes like pumpkin pie. It is orange in color with a full rich taste that makes you want more….we carbonate the cider, cold- filter it four times before we bottle and keg it. This cider is released after Labor Day and is ideal for Halloween through Thanksgiving; although some customers think we should make it year round. It is the first Pumpkin cider to be made out West. One word for ACE PUMPKIN, delicious! What’s that bite of tartness doing in a pumpkin beer? Adding the unexpected kick of cranberry juice to brighten this traditionally spiced seasonal ale. PUMPKICK is brewed with plenty of pumpkin juice, cinnamon, nutmeg, and allspice, but it’s the cranberries and touch of lemongrass that send your tastebuds sailing. The newest addition to the Chatoe Rogue series is Pumpkin Patch Ale, a beer made using fresh pumpkins grown in a patch that borders Rogue’s 42 acre hop yard. The pumpkins are picked, loaded into Rogue’s farm truck, driven immediately 77 miles to our brewery in Newport, quickly roasted, and pitched into the brew kettle to create a batch of Pumpkin Patch Ale. Smashed Pumpkin is a big-bodied beer with a light coppery orange color and pleasing aroma of pumpkin and nutmeg. The OG and final Alc./Vol. provide the structure and body. Pale Ale, Wheat and Light Munich Malts combine with the natural tannin in pumpkin and the delicate spiciness of Willamette and Hallertau Hops to balance the sweetness of the fruit. To fully enjoy all the flavors, this ale is best drunk at 55 degrees Fahrenheit. Smashed Pumpkin pairs well with sharp cheeses, nuts, lamb, hearty stews and desserts like flan or pumpkin pie. Chefs find this an excellent beer to cook with in dishes such as braised short ribs. 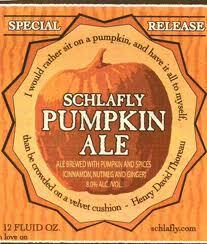 Ale brewed with pumpkin and spices. Handcrafed using real pumpkin and savory pumpkin pie spices and hints of all natural cinnamon and nutmeg. Perle hops balance with rich Munich, Roasted, and Caramel malts for the full-bodied taste and exceptional flavor. A perennial favorite at our Brewery Halloween party, this reddish amber ale is perfect for fall. Real pumpkin adds a full body and sweetness, while deep roasted malts lend a toasty finish to this subtly spiced brew. Pumpkin Lager is brewed with pumpkins in the mash, spices added during the boil, and lightly hopped. The rich specialty grains and lager fermentation combine to produce the taste and the texture of pumpkin pie.